26 year-old close to signing a deal with Brazilian side Internacional. 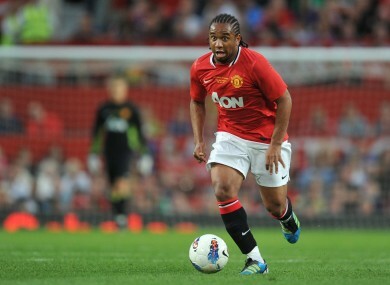 AFTER SEVEN AND a half years at the club, it seems Brazilian midfielder Anderson is finally leaving Manchester United. Writing in his One Hour Behind blog, Juan Mata passed on his best wishes to the ex-Porto player, revealing he was back in his native Brazil. It later emerged that the 26 year-old is undergoing a medical with Internacional. Sir Alex Ferguson signed Anderson in the summer of 2007 for £20m on the recommendation of his brother, Martin – the a United scout. In his autobiography, Ferguson later recalled that his sibling passed along a message after watching the box-to-box midfielder: ‘He’s better than Rooney’. But despite winning four league titles, a UEFA Champions League and one FIFA Club World Cup, Anderson only made 70 top-flight starts for United with fitness issues and injury problems continuously overshadowing his time at the club. In January last year, he moved to Serie A side Fiorentina on loan but failed to impress. Early reports are speculating that Anderson, who started his career with Gremio, will sign a four-year deal with Internacional and may be on as much as £110,000 per month. Email “Manchester United may have finally off-loaded midfield misfit Anderson ”. Feedback on “Manchester United may have finally off-loaded midfield misfit Anderson ”.